18 x 40”, oil on canvas, 2012. Sold. 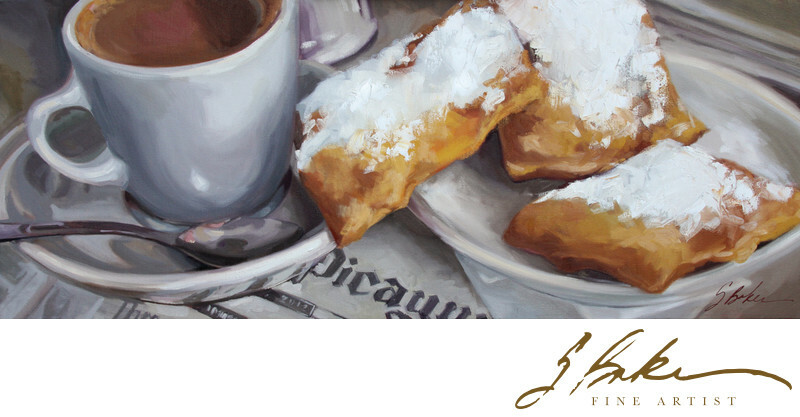 The Restaurant, “Morning Call," has been serving café au lait and beignets since 1870. Originally located on Decatur Street in the French Quarter, Morning Call, moved to its present location in Metairie, in 1974. Beignets, a New Orleans creation, are a hand rolled and cut, “French market donut." It is deep fried and dusted with powdered sugar and best served with, café au lait, a rich chicory coffee mixed with heated, whole milk. This painting was one of three pieces painted for a group exhibition at “The Garden District Gallery," in New Orleans, Louisiana. The show entitled, “The Times-Picayune: An Iconic Presence in Our Daily Lives," was in response to the Picayune cutting its circulation to a three day a week publication. It explored the myriad ways the newspaper was an integral part of NOLA. painted for a group exhibition at “The Garden District Gallery," in New Orleans, Louisiana. The show entitled, “The Times-Picayune: An Iconic Presence in Our Daily Lives," was in response to the Picayune cutting its circulation to a three day a week publication. It explored the myriad ways the newspaper was an integral part of NOLA.